So this Mother’s Day — if your mama has a funny bone too — take a few moments to watch these hilarious SNL mom-related skits. You won’t regret it. Thanks to Saturday Night Live, mothers everywhere had to abandon their beloved high-waisted, wide-hipped jeans or be publicly ridiculed. This SNL skit, a “commercial” for Mom Jeans, promises you’ll find the perfect fit for even the least active of moms. If you really want to freak your family out this Mother’s Day, bust out the Mom Jeans and applique vest. Stephan Mothers Day Report from john yamashita on Vimeo. City correspondent Stefon stops by Weekend Update to share his ideas on where to take Mom on Mother’s Day. Those suggestions include his trademark recommendations of clubs that are pronounced with loud noises instead of actual names and where the misuse of small people is incorporated into the entertainment. The best element of these skits, aside from the obvious, is Bill Hader’s inability to keep a straight face during his reviews of underground clubs you absolutely do not want to take your mother to. 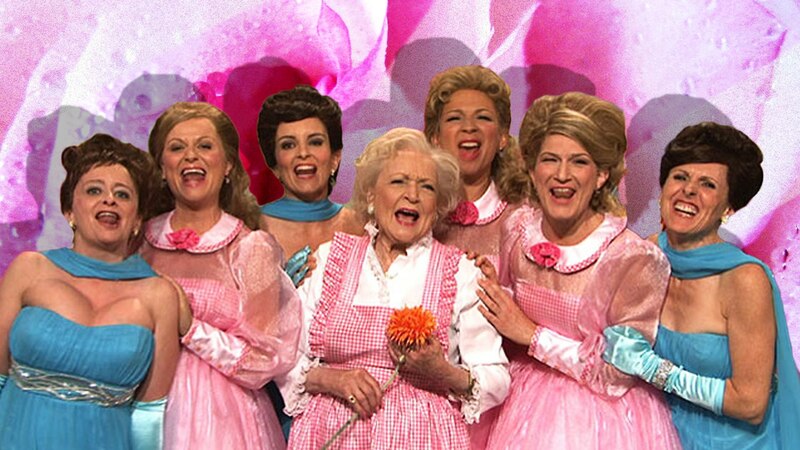 For those of us who remember writhing in agony while our grandmothers watched Lawrence Welk on Saturday night, SNL‘s version is spot-on. This knock-off is parody perfection with the beloved Betty White as the mother of four daughters, one of which has an unfortunately high hair line and creepy little doll hands. In this hilarious Amazon ad, moms don’t want breakfast in bed, a brand-new washer or a bath set to help them relax. No, give Mom a gift she really wants: time alone to enjoy Fifty Shades of Grey on her new Kindle. Watch Brie Larson’s character get educated at her first baby shower on the “mom hair.” “It looks like you were going to a formal event, but on the way, you got struck by lightning!” says Vanessa Bayer’s character.